Join us this Friday, June 17th in Hannover at the biannual German Tanzkongress! Julek Kreutzer and Kareth Schaffer will facilitate a short “Write Your Pledge” session within the frame of a 3-hour workshop called “Reality Check and Dream Machine: Learning and Teaching in Contemporary Dance Education,” co-hosted by Florian Feigl, Eva-Maria Hörster, and Renan Itzhaki. See you on Friday, June 17th, Hannover Oper, Probebühne 2, 11.30-14.30! Students and teachers of the Hochschulübergreifendes Zentrum Tanz (HZT – Inter-University Centre for Dance) Berlin discuss with colleagues of other educational institutions the preconditions and goals, the ideals and realities of university training in dance, choreography, and performance. How can dance, choreography, and performance be learned and taught today? How do individual interests and institutional guidelines as well as theory and practice relate to each other in artistic studies at universities? In which way do art universities feel responsible for their teachers, students, and local environments? The discussions take place within the frame of a workshop, which will be accompanied by two artistic actions: In the happening ‘Collecting points’, experienced coaches navigate Congress participants through the practice and project work, the contexts and modules of studying contemporary, experimental dance and choreography. The initiative ‘Artist’s Pledge’ assists young artists in subsisting after their studies and in formulating their own artistic and ethical projects. 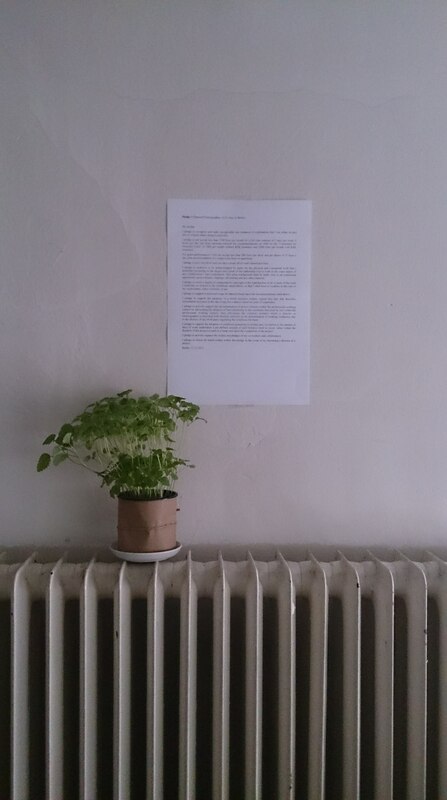 The artist’s pledge is hanging around at transeuropa 2015 in Hildesheim. Come and join us, write a pledge, enjoy the coversation, the look out of the window and the music. Find us next to the AULA on the second floor, room 205. The Artist’s Pledge has started off the New Year with TWO very special new pledges! Pledge 21 is our first pledge from an Amsterdam-based artist and a plea for what shall henceforth be known as ‘artistic localism’. In it, the artist concentrates on the specific problem of “urban nomadism”: contemporary dance production structures demand that artists circulate the globe just to make work. i.e., by travelling to different residenciess. She postulates that this is no longer a sustainable mode of production and calls for artists to insist on making art in the places they live, in exchange with their local audience. Pledge 22 is our first pledge from a CURATOR, or rather, an artist who describes themselves as both artist and curator. In this sense, the artist offer some fresh perspectives from another side of the power divide, and how she allows both of these fields to enrich her work. We hope to see some more pledges soon, hopefully also some in German! Neues Deutschland talked about us…. In Tom Mustroph’s review of the Ackerfestival over at Neues Deutschland, the Write.your-pledge event was mentioned with some solid quotes from Julek Kreutzer. Awesome! The Artist’s Pledge will meet other initiatives demanding fair working conditions for artists at a panel discussion this week, Tuesday September 24th, at 19.00 in Uferstudios, Studio 2. Der gesellschaftspolitische Förderauftrag von Kunst und Kultur steht mittlerweile in starkem Widerspruch zur Realität von häufig porösen und temporären Beschäftigungsverhältnissen im Kunst- und Kulturbereich. Kulturpolitische Förderwürdigkeit von Kunst knüpft sich zunehmend an das Kriterium der Marktkompatibilität. Das Bild kreativen, innovativen Unternehmertums, das insbesondere über die freie Kunstproduktion gestülpt wird, verschleiert aber, dass Kunstproduktion selbst in den seltensten Fällen verkäufliche Produkte hervorbringt. Zeitgenössische Kunst findet häufig in offenen Projekten oder Prozessen statt. Mangelnde Strukturen sowie wirtschaftliche Erfolgserwartung zwingen – insbesondere Kunstschaffende im freien Bereich – in Formen der (Selbst) Ausbeutung. Auch in den Institutionen, die aufgrund kontinuierlicher Subventionen noch Freiräume für Kunst zu versprechen scheinen, gibt es keine Garantie mehr für eine angemessene Wertschätzung der einzelnen Kunstschaffenden. Die Initiativen Honoraruntergrenze von TanzRaum Netzwerk und LAFT Berlin, die Bewegung Art But Fair, die ursprünglich aus dem Opernbereich stammt, und die Initiative Artists‘ Pledge des Zeitgenössischen Tanzes Berlin stellen die Verantwortung von Kunstschaffenden für die eigenen Ressourcen und den Anspruch auf Anerkennung der Leistung in den Mittelpunkt ihrer Argumentation. Haben und Brauchen insistiert auf die Anbindung von künstlerischer Produktion an das gesellschaftliche Gemeinwesen, als Voraussetzung überhaupt für die Entstehung von Kunst. Im Rahmen der Kampagne der Koalition der Freien Szene, die auf eine Neuausrichtung der Kulturförderung zielt, werden die Initiativen vorgestellt und diskutiert. Aus welchen Kontexten haben sie sich entwickelt? Welche Ansätze verfolgen sie? Und welche Wirkung können sie – auch auf andere Gesellschaftsbereiche – entfalten?